Rather than try to make this a discussion of the historical evolution of the banjo, I'll just present a few of the most common types of banjo you're likely to run across. In order to give you a sense of scale (pun intended) I'll mention the vibrating string length, measured from nut to bridge, which is the usual method of describing instrument sizes. Please click on any of the photographs to zip over to the full Museum or New Instrument Gallery article which includes a full series of photographs of that particular instrument. 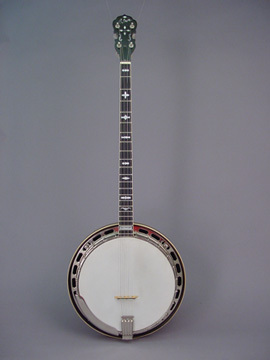 It is the only style banjo used in bluegrass music, and it is played in a syncopated picking style, using fingerpicks. Bluegrass banjo players usually use G-tuning for most regular playing (G,D,G,B,D, starting with the fifth string) or D-tuning (A,D,F#,A,D). C-tuning (G,C,G,B,D) is a common folk tuning sometimes used in bluegrass. 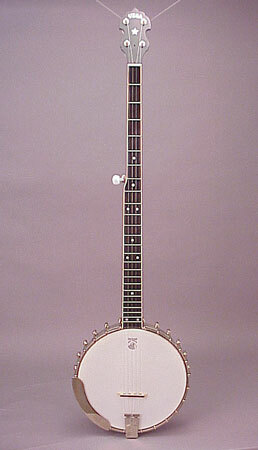 The open back banjo is often called a "frailing banjo," "old time banjo" or "clawhammer banjo," after the playing styles, which generally involve a rhythmic right hand technique, using no picks. In playing old time music, there are lots of major, minor and modal tunings, many of which are unique to certain melodies. 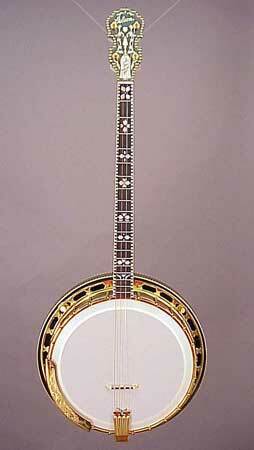 Both styles of five string banjo have scale lengths ranging from 26 to 27 inches, and 22 frets. Illogical as it may seem, the five string banjo is the first banjo style which developed as the banjo came of age in the 19th century. 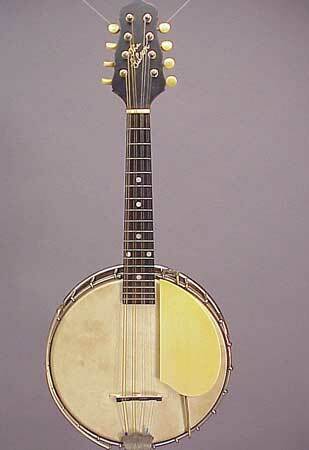 For that reason, most banjo factories called them "regular banjos" to distinguish them from some of the newer types. Even today, the suffix "RB" is attached to the model designation of all Gibson five string banjos. This is one long banjo! Its scale is a hefty 32 inches, and it has 25 frets. Pete Seeger, and later the Kingston Trio, became so popular that thousands of long neck banjos were built and sold to eager folk musicians, many of whom bought the long neck because of the "look." In fact, that's just how this instrument developed. Players, wanting to be heard in the new jazz bands, simply discarded the fifth string and strummed the banjo, chording it with a pick, or "plectrum." Plectrum banjos have the same scale length (26-27") and number of frets (22) as regular five string banjos. Tuning is either the same as C-tuning on five string (C,G,B,D, low to high) or the same as the first four strings of a guitar (D,G,B,E). The tenor banjo was the single string melody king of the jazz age, and professional models were often elaborate and gaudy, like this one. It was played exclusively with a flat pick, just as the plectrum plectrum banjo. Today, lots of tenor banjos are finding their way into traditional Celtic string bands. 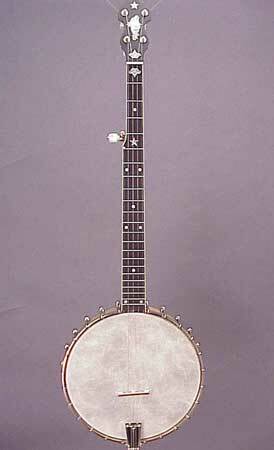 Tenor banjos have scale lengths from 21 to 23 inches. Like all the hybrid banjo family, it takes its name, tuning, and playing style from its neck. 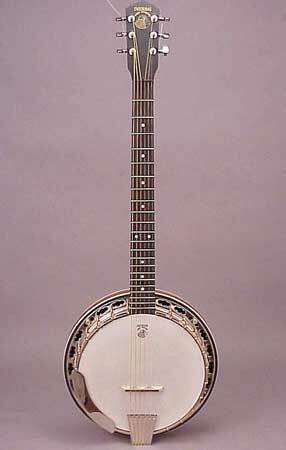 Tuned in fifths just like a mandolin (G,D,A,E, from low to hihg) and a scale length from 13 to 14 inches, the mandolin banjo was popular during the 1920s. Mandolin banjos were and are always played with a flat pick. Tuned like a ukulele, and strung with the same gut strings (nowadays, nylon) as a ukulele, the ukulele banjo is a perfect instrument for the kids in the family whom Dad would like to keep off his bluegrass machine. The scale length is 13 to 14 inches, the same as a standard soprano ukulele. Traditionally the banjo varieties take the first part of their names from the style of the neck and the way in which they are tuned and played. The ukulele banjo is the only one with an assortment of nicknames, including "banjo uke" and "banjolele." 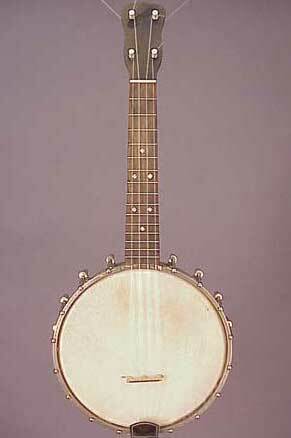 In fact, it's most commonly called "banjo uke." 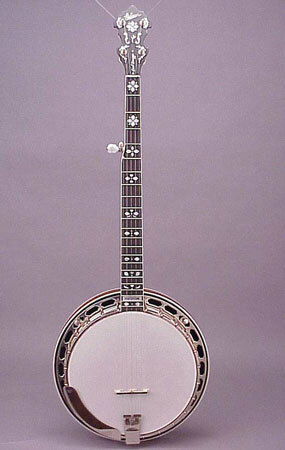 In fact, this is a new guitar banjo, made by Deering. Tuned like a guitar (E,A,D,G,B,D) the guitar banjo has a scale length in the 26 inch range, just a bit longer than the usual guitar scale. Every time I see one of these critters, I think of the Sam & Kirk McGee, stars of the Grand Ole Opry. If you haven't heard their raggy country blues, you've really missed something! These are the seven most likely kinds of banjos you'll encounter in this country. Suffice it to say that there are myriad others, mostly of historical interest. So, you may hear about the banjeaurine, piccolo banjo, cello banjo, tango banjo, zither banjo, and others. I'll save such instruments for a discussion (maybe later) on banjo evolution.